One of the healthiest things you can do after a great workout is replenish the body with nutrients to make your workouts even more effective. Come check out the variety of smoothie options, including those with extra protein. Created by The Smoothie Company, you will find them to be less sugary than others on the market. The Smoothie Bar also features freshly-made sandwiches, salads, fruit, and other healthy offerings in keeping with the concept of health and fitness for ARFC members. Eat it here or take it out, ARFC's new Smoothie Bar has it all for you! Hours of the Smoothie Bar are Monday through Friday, 9:00 AM to 2:00 PM and Monday through Thursday 4:00 to 7:30 PM: Open Saturday 9 AM to 12:30 PM and Sunday from 9:30 AM to Noon. 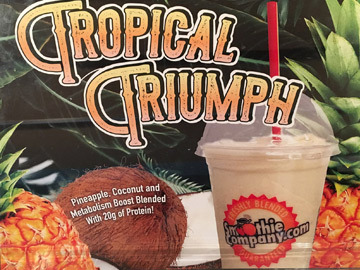 This month we are featuring the Tropical Trumph Smoothie, a delicious blend of pineapple and coconut with 20% protein added for an extra metabolism boost. It's another perfect after workout pick-me-up. Come on by and give it a try.